Welcome to our family of independent nurseries! 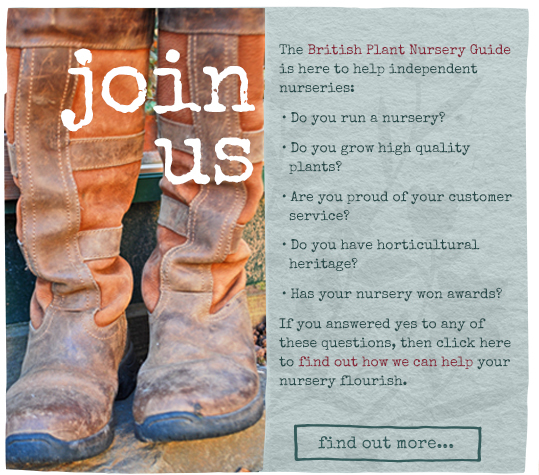 The British Plant Nursery Guide is a collection of independent nurseries that have that ‘little something’. Whether it’s because they win awards for their fabulous plants, offer excellent customer service or are located in a beautiful location, all our nurseries have that little something extra which makes them totally unique! What makes our family a little different is that all our nurseries have roots and shoots, in other words they have plant heritage. If the owner isn’t busy directly getting their hands mucky growing and nurturing, then they’re probably busy attending to matters on the nursery – in other words they are from good root stock!